1.Cancer Prevention- Resveratrol, a compound found in grape skin is a potent antioxidant, which is effective to prevent cancerous growths. Resveratrol has the ability to penetrate deeply into the center of the cell’s nucleus, which allows the DNA to repair free radical damage that can contribute to cancerous growth. 2.Cardiovascular Health- The Phytochemicals present in grapes helps lessen injury to the heart muscle. Drinking 1-2 cups of grapes every day will not only lessen injury to the heart muscle, it will also help lower blood pressure to improve the functions of the heart. 3.Allergy Relief- Red Grapes contain Resveratrol, which helps relieve allergy symptoms and improves breathing. Resveratrol is anti-inflammatory. 4.Digestive Health- Grapes are good for GI tract health. It helps soothe irritated digestive tract and it works great as a mono-meal to improve digestive function. Grapes can help get rid of indigestion and irritation. 5.Bone Health- Grapes can help nourish and strengthen our bones. It protects the bone by improving calcium retention. It also prevents osteoporosis. 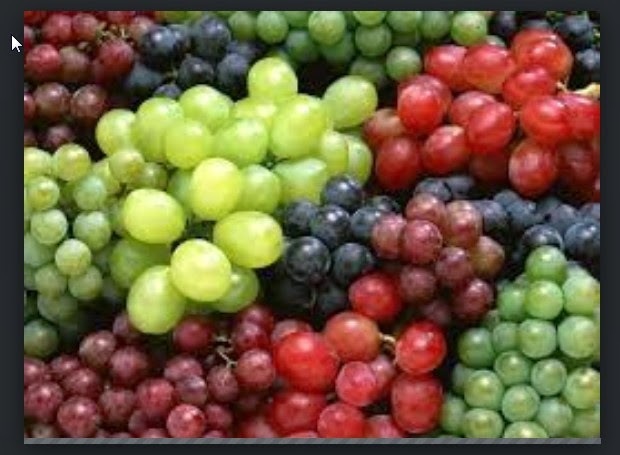 6.Lung Support- Grapes can help clean out the lungs. A freshly squeezed grape juice, which you drank for 5 to 7 days or by simply eating a grape will help detox and clear the lung of impurities. 7.Migraine Relief- Grapes can relieve migraine. It helps lower blood pressure and migraines caused by an enlargement of blood vessels in the head. 8.Sustained Energy- Grapes helps improve and sustain energy levels that will last the whole day. 9.Eye Health- Grapes protect the retina from deterioration. It protects our photoreceptors and help prevent macular degeneration and other eye diseases. 10.Kidney Health- Grapes are diuretic and helps clean kidneys and help remedy kidney stones. It is also great for the bladder by improving urination and eliminating toxins.